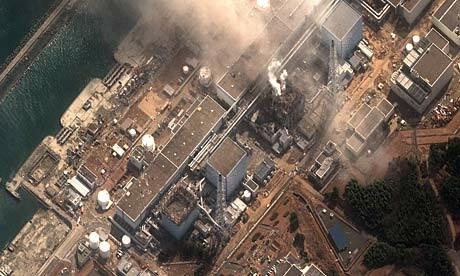 It’s a bit late (7 weeks in, and this post has been in the hopper for several), but still relevant under the “Forever Overhead” rubric if not nuclear catastrophe. This is more specifically about the “democratizing” aspect of what can be done with publicly-available (or private data leaked to an inquisitive public) aerial imagery when the agencies nominally responsible for keeping us informed are less than forthcoming. First, we have a series of aerial photos of the Fukushima Daiichi complex, released by cryptome.org (as part of their extensive “Eyeballing” series–like “Forever Overhead” without the musing) and annotated by the Union of Concerned Scientists and available in two posts, here and here. 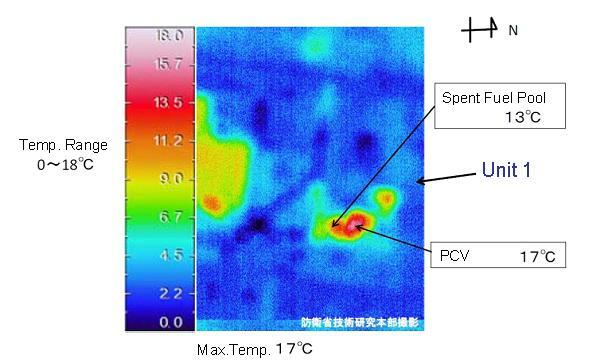 Then, we have a series of “thermographs” from the Self Defense Force, assessing the temperature of the reactors and spent fuel pools. 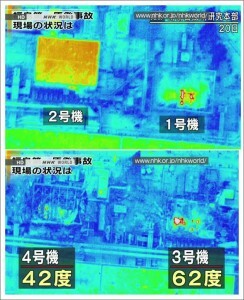 They’ve performed overflights and released images with some regularity and the reports are available here. 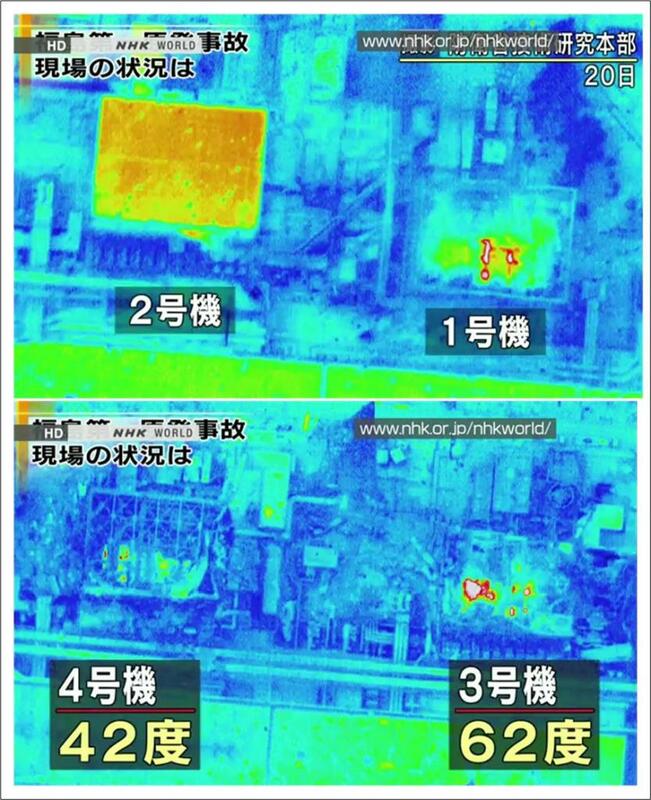 Via “The Big Dustup” we have some much higher-resolution thermal images (from NHK TV) and some analysis of the overall damage. I also recommend a number of his other damage assessment analyses. 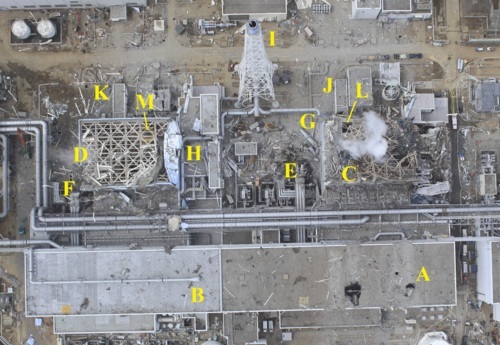 YouTube user “Kurtsfilmevideo” has taken a series of aerial footage clips from Fukushima (and a variety of other clips from the tsunami) and software enhanced and “de-shaked” them, affording some pretty remarkable views. “Forever Overhead” is a series about satellite imagery, drones, aerial sensing/imagery–any overhead technology where the seen subject may be unaware of the specific instances of that seeing (a sort of vertical Panopticon). And also, the sometimes power-balancing effect of public access to these data. The topic for me is an old one, and, incidentally, the title is the same ad my favorite David Foster Wallace story. 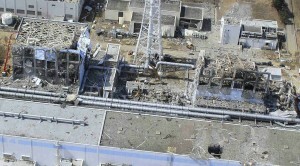 MIT’s Nuclear Science & Engineering department has a wonderful blog on Fukushima/Fukushima-related items. Jeffrey Lewis at the wonderful and recommended Armscontrolwonk (he is the original/eponymous wonk, the Ur-wonk there) has been posting daily updates from Japan’s Federation of Electric Power Companies. Areva has a quite decent PPT rundown of the chain of events (note: Areva is one of the world’s largest nuclear energy conglomerates–they work primarily in Europe but do also operate in the US), with plenty of images. I’d been intending to link to to a FP interview with Stewart Brand on nuclear energy, and paused to think of some clever way to refer to his hoary nerd-hippie credentials, but just realized FP did this for me when they referenced the seminal “Whole Earth Catalog” he started as a “hippie omnium gatherum and Boomer cultural touchstone”. Relieved of that burden, I’ll simply include the link and refer back to an earlier post on an event hosted by Brand’s Long Now Foundation. Since I seem to make a habit of shilling for The Long Now, one of my favorite sessions was a debate between Peter Schwartz and Ralph Kavanagh on nuclear power. Spent fuel pools actually pose more of a risk in the United States because the pools here contain more fuel than do those in Japan. The U.S. National Academy of Sciences even reprimanded U.S. plants for ignoring the hazards of spent fuel, but the warnings continue to fall on deaf ears. This could be a lesson on unintended consequences: one reason US plants have to hoard so much is that commercial reprocessing used to be illegal (made so by President Carter, following a Presidential Directive by Ford). While Reagan reversed the ban in 1981, the nascent reprocessing industry never recovered. Like the nuclear plants themselves, reprocessing is expensive (relative–apparently, so far–to the risks of storage and the cost of “fresh” uranium). Also, another “alternative” to spent fuel pools is long-term storage–Yucca Mountain in Nevada was the place where this would ostensibly happen, but that political albatross seemed to shut down more discussion than it provoked, often invoking false dilemmas broader than the core issues. I bring this up because so much public and political discussion concerns the manner of storage, and methods such as dry cask storage versus the Yucca Mountain controversies, but there’s less discussion of reprocessing. 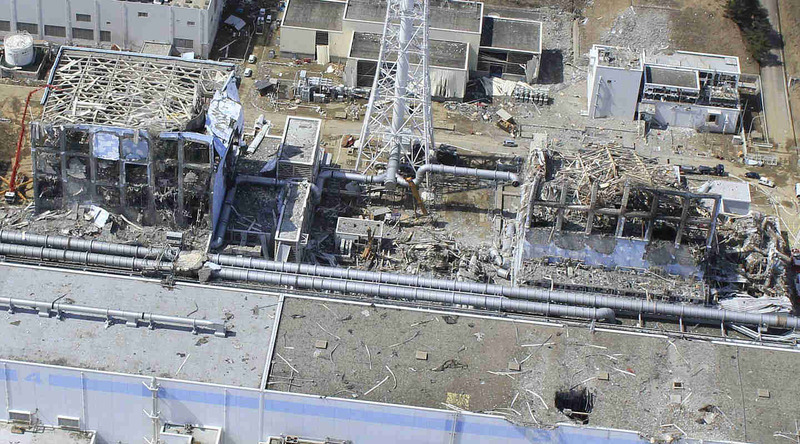 So much uranium remains (90+ %) after fuel rods are retired that both the words, “spent” and “waste” are misnomers. While better and more reliable storage matters, it is also possible that we could be storing less and putting the remainder to use–reprocessing can not only reduce volume but can recover large amounts of “usable” uranium (which is, of course, a finite natural resource). Now, the proliferation risk of reprocessing is considerable, as reprocessing uranium also separates out masses of “usable” plutonium. This is the main way North Korea, for instance, gets its plutonium (by the way, lest you think my defense of reprocessing excessive, Fukushima actually included one reactor fueled by plutonium created through reprocessing). Reprocessing itself can have both legitimate and nefarious objectives–this is why you might hear about monitoring for diversion of material. One might wonder whether the fact that bad actors do it for bad reasons mean it shouldn’t be done for any reason. There is, considering that point, the commitment of the nuclear-armed states under Article VI of the NPT to pursue disarmament in “good faith”–perhaps that’s a reason not to reprocess… I jest really–to continue pursuing that line leads to setting up phantom straw men just to tear them down. Back to unintended consequences: I’m concerned that Three Mile Island (and “The China Syndrome”) casts such a long shadow, and that every other nuclear event–relevant or not–relevant or not–(most notoriously The Bomb before, or Chernobyl after) serves too well to buttress it, that the scale or scope of technologies/R&D that might have decreased cost, increased safety and efficiency, etc. that decades of neglect in the name of security might have been the result. A spectacular accident occurs, confirmation bias is invoked on both “sides” of the issue, the effects subside, we survive and forget.